Volkswagen has announced a replacement for its current 2.0-litre diesel engine with Selective Catalytic Reduction (SCR). The motor will first appear in the second half of 2014 under the hoods of the Golf, Beetle, Jetta and Passat TDI models. 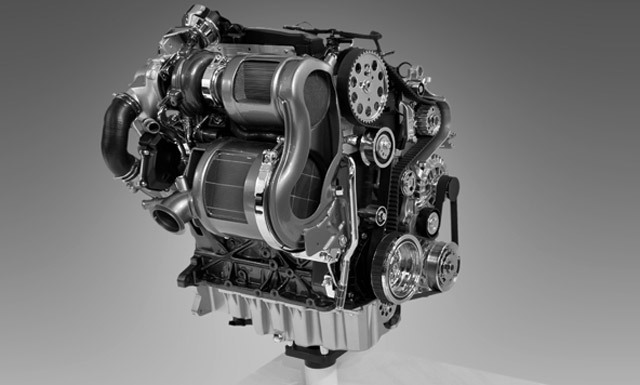 The new 2.0L EA228 engine is designed to provide “scalable” options for expected legislation such as Euro 6 as well as California’s Lev III standards.. The engine will come with an after treatment system including Diesel Particulate Filter (DPF) and advanced Exhaust Gas Recirculation (EGR) technology. Both DPF and SCR technologies are combined in one component saving space and costs. The primary innovation of this new engine design is that the exhaust gas recirculation (EGR) valve and the water-cooled intercooler have both been integrated with the intake manifold. That change, combined with many others including new piston rings and a two-stage oil pump, will result in improved emissions and decreased friction within the motor itself. Displacement will remain at 2.0-litres, but output will jump by 10 horsepower to 150. Torque will remain constant at 236 pound-feet. While it will first roll out in four models, Volkswagen says this new engine will ultimately appear in all VW and Audi products. VW is the leader in diesel sales in the U.S. – representing about 78 percent of the diesel sales for passenger cars, according to officials. Robert Bosch, a global multibillion-dollar engineering and electronics automotive leader, anticipates more than 50 light-vehicle diesel models to be announced or released by 2017 in the U.S. market. “Clean diesels” are 30 percent more fuel-efficient, produce lower CO2 emissions and maintain a higher residual value compared to traditional gasoline engines. So this improvement in efficiency will achieve 45mpg average city/hwy and over 55mpg highway by our calculations. If there is no change to the current fuel tank capacity, this new engine will provide a road trip single tank range of over 1,000 miles. If drivers are burning B20 in these new engines, that calculates out to about 55mppg average and 65mppg for highway driving. So why are people still buying gasoline powered vehicles? Join the U.S. Migration!